Artist Arnold Friberg graduated from the Chicago Academy of Fine Arts in 1935. In 1953, Cecil B. DeMille, after searching worldwide for a powerful Biblical artist, was shown Friberg’s religious series then in progress. In 1957-58, Friberg’s monumental 15 paintings series for “The Ten Commandments” toured the world, and in 197 was part of DeMille’s exhibit honoring the 100th year of Hollywood, an exhibit seen by more than one million viewers. In 1958, Arnold Friberg was made a lifetime member by Prince Philip, Duke of Edinburgh, of the Royal Society of Arts (RSA), London, in recognition of his contribution to mankind through his work. 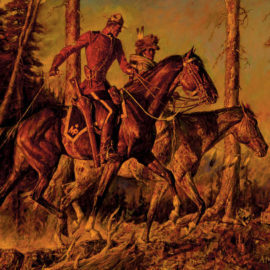 Over a period of 42 years (1937-79), Friberg painted close to 300 repesentative “Mountie” images for the Northwest Paper Company. In 1978, the Friends of the Force, an affiliation of the R.C.M.P., commissioned Arnold Friberg to paint a lifesize portrait of HRH Prince Charles with the splendid royal mount Centennial. The Friends of the Force were so pleased, they commissioned Mr. Friberg to paint a large royal equestrian portrait of HRM Queen Elizabeth II mounted on Centennial, in the palace garden at Buckingham.